Many in the Pennsylvania Jewish community may need one of these before they can participate in this years historic Presidential primary. The first since 1952 with no clear nominee in either party. Next year on Pennsylvania Avenue. To us in the Jewish community, April 22 is the first day of chol hamo'ed pesach. The Pennsylvania primary is scheduled for the first intermediate day of the Jewish holiday of Passover. If your Passover Seder plans include travel and you are not sure to return to Pennsylvania before the April 22 primary, please be sure to vote before you go. While we may support different candidates in the Presidential election, there is widespread agreement that this is a historic election whose ramifications will have great impact in Pennsylvania, throughout the United States, in Israel, and throughout the world. We need to make our voices heard in this election. While most of the states will have voted by Super Tuesday, the battle for the nomination will probably continue as candidates campaign in state after state trying to pick up delegates. Conceivably the nominees might be determined on the floor of the Democratic National Convention (August 25-28) in Denver, Colorado and the Republican National Convention (September 1-4) in Minneapolis-St. Paul, Minnesota. Many criticized Pennsylvania for not joining the 24 other states participating in "Super Tuesday", February 5, fearing that the Republican and Democratic nominees would already be determined before Pennsylvanian had the opportunity to cast their votes. In fact, it is becoming clearer that Super Tuesday will not decide the nominations after all. With no primaries for a couple of weeks before or after Pennsylvania, the candidates are likely to focus on the many delegates at stake in the Keystone state on April 22. In addition to an important Presidential primary election, candidates are vying for your support up and down the ballot, from precinct captain to U.S. Congressman. For example, in Pennsylvania's 6th district Jim Gerlach squeaked by Lois Murphy in 2004 and again in 2006. Lois Murphy is not on the ballot this year, but four other democrats are contending with each other for the opportunity to take on one of the most vulnerable incumbant Republicans in Congress. 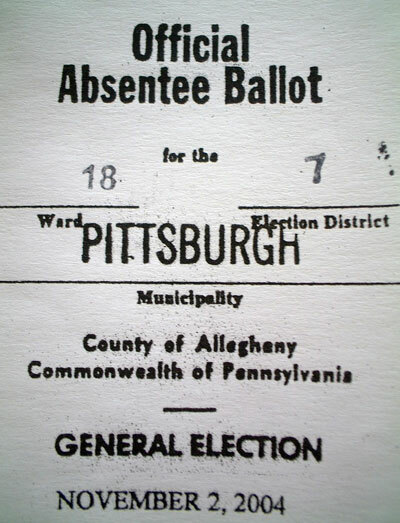 Click here to obtain a Pennsylvania absentee ballot. Fill out the application according to the Department of State instructions. In section A, as "reason for absence" you may write "Observance of a religious holiday (Passover)." Mail or deliver the application to your County Board of Elections. Here is a selected list of nearby counties. For the complete list of counties, go to the PA Department of State Website. Bucks County, 55 East Court Street, Doylestown, PA 18901-4318, (215)348-6163. Chester County, 601 Westtown Road, P.O. Box 2747, West Chester, PA 19380-0990, (610)344-6410. Delaware County, Government Center Building, 201 W. Front St., Media, PA 19063-2728, (610)891-4659. Montgomery County, Courthouse PO Box 311, Airy & Swede Street, Norristown PA 19404-0311, (610)278-3280. Philadelphia County, 520 N Delaware Ave, 5th Floor, Phialdelphia, PA 19123-4295, (215)686-1505. Call the County Board of Elections if you are not sure they have received your application or are worried you will not receive your ballot in time. Ballots are sent out as applications are received. If you know of any Jews in Pennsylvania, please direct them to this article at http://www.pjvoice.com/v32/322105passover.aspx so that their votes will be counted. Best wishes from the Philadelphia Jewish Voice for a Happy Passover, and thank you for participating in the democratic process.